The secret behind the superhuman faith of Liora Silberstein and Udel Cohen. The main feeling I’m having right now, in the wake of this last traumatic week, is awe. Awe for the Jewish people and for Jewish mothers in particular. Last Sunday night, as you all know, the parents of Shira Ish Ran, Chaim and Liora Silberstein, rushed to the hospital after hearing that Shira had been injured in a terror attack. That night, their firstborn daughter was in surgery for six hours, and for an hour an half, it seemed that Shira was not going to make it. I have known Liora Silberstein for 22 years. And for as long as I’ve known her, Liora has been a person who glows, whose smile lights up a room. So seeing Liora speak with reporters the morning after the attack made me cry. Even now, thinking about it, it brings tears to my eyes. It was like a seeing a torch that had been snuffed out. She expressed her gratitude to the medical staff who, she said, had provided care that was above and beyond. She expressed gratitude to all the people who were praying. But over the course of last week, through the faith-filled eyes of Liora and her husband, as well as the father of Amichai Ish-Ran, I was able, also, to understand the great kindness that Hashem had done for the Jewish people on the night of that attack. Shortly before the attack, hundreds of community members had attended Ofra’s annual Chanukah candlelighting. Just 15 minutes before that terrorist started shooting, the event had ended, and the vast majority of people had already left. As Amichai’s father, Rabbi Raphael Ish Ran pointed out, the terrorist had shot dozens of bullets at the crowd of people standing there. Yet there was only one casualty, the baby Amiad Yisrael, Hashem Yikom Damo. And then, this past Friday, I saw an interview with the mother of IDF soldier, Yossi Cohen, who was murdered next to Givat HaAssaf last week. Udel Cohen, through her intense grief, like Liora Silberstein, first and foremost expressed her gratitude, thanking Hashem for the 19 and a half years He had granted her with her beloved son. How is it possible for a mother, for any human being to do that? And this, I now believe, is the answer. Liora Silberstein and Udel Cohen have spent decades working on feeling gratitude, on feeling faith in Hashem. Feeling faith and gratitude at everyday moments–that were irritating, or frustrating, or challenging. Minor league challenges as well as major league challenges they have faced. 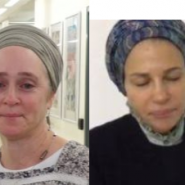 That daily focus is what enabled these mothers, I believe, at possibly the darkest moment of their lives, to feel that gratitude, to feel Hashem’s embrace within the darkness, to feel their unwavering faith shining the way for them. Yes, you said it well, with G-d’s help, they have been in training their whole lives.